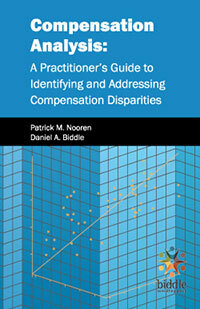 Author: Patrick Nooren, Ph.D. and Dan Biddle, Ph.D.
Patrick Nooren's Compensation Analysis book provides you with guidelines and analysis steps that allow you to identify which of your selection procedures have adverse impact and how to complete a defensible validation study using court-endorsed methodologies. Given the dynamic nature of the Office of Federal Contract Compliance Programs (OFCCP), it should come as no surprise that the chapter in this book dealing with OFCCP-specific compensation enforcement (How the OFCCP Will Likely Evaluate the Data, pages 80-93) is out of date. Since the initial publication of this book in 2010, the OFCCP has changed enforcement strategies several times, including rescission of the 2006 Standards and Guidelines and release of Directive 307, which outlines their “new” enforcement strategies. Further, the President has called for new proposed regulations by the OFCCP to collect and analyze summary compensation data from all federal contractors, requiring a whole new set of strategies. The bottom line is this . . . more so than ever, federal contractors need to be proactive about identifying and rectifying non-job-related disparities in compensation between similar employees. As the dust settles from all of this activity, Biddle Consulting Group will release an updated version of this book to address the (then) current OFCCP enforcement strategies. Stay tuned, and hold-on tight for what I anticipate to be a very turbulent next couple of years. Patrick is the Executive Vice President of Biddle Consulting Group, Inc., a firm that specializes in the areas of EEO/AA compliance, test validation and development, compensation analysis, litigation support, and software development. Patrick has over 20 years of experience in the EEO/AA industry and has worked with hundreds of clients of all sizes to develop their Affirmative Action Plans and support them during audits. He has conducted training in cities across the nation and has authored numerous articles and software programs in the areas of affirmative action, disparate impact, test validation, compensation pay equity analysis, and EEO.